The school’s theatre features Luceco’s Platinum Downlights which provide energy savings of up to 80% when compared with conventional lighting. 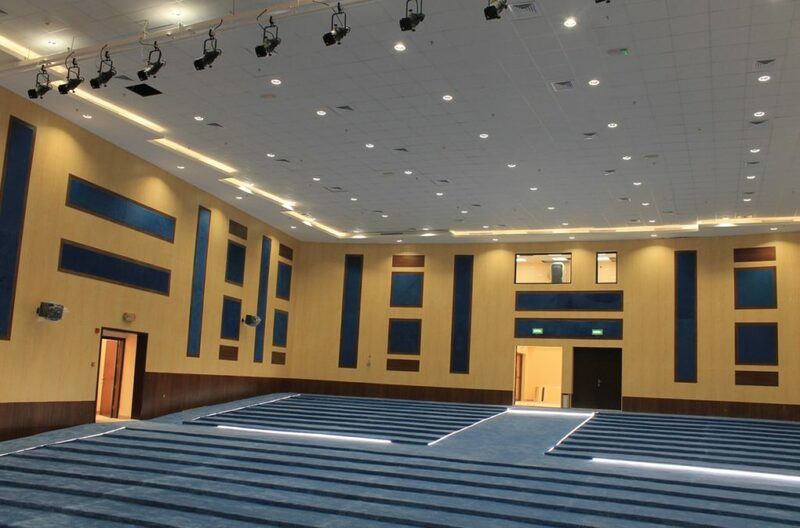 Luceco has recently supplied Abdul Razzak Al Basir Secondary School in Kuwait with a complete LED lighting solution as part of a refurbishment that has provided improved classrooms, theatre and assembly areas, free flowing corridors and better play areas. Ease of movement around Abdul Razzak Al Basir Secondary School has been enhanced by improved lighting. Attention was given to the lit route between lessons to ensure quick and safe access for both staff and pupils. Uniformity of light and good luminaire choice is key when lighting educational establishments. The use of LED LuxPanels prevent intrusion from the luminaire, creating an open space for a large number of people to move around in. IP65 rated Climate LED luminaires were used in workshops, plantrooms, and storage areas, with versatile IP65 rated LED Atlas luminaires used on stairwells and entrances. Titan Hibays were installed in sports facilities to achieve the required lux levels. The High Bay comes in 110W and 200W options offering more than 50,000 hours’ maintenance free operation. Restrooms were lit with Carbon Downlights. The school’s theatre has been lit with Platinum Downlights from Luceco providing energy savings of up to 80% when compared with conventional lighting. Platinum features easy-fit positive locating swing out tabs and interchangeable bezels and is ideal for use with sensors and lighting controls as well as being designed to retrofit ceiling cut outs of common compact fluorescent downlights. Contemporary Architectural Wall lights and Guardian Pro LED flood lights now light the school’s exterior. Architectural Wall is a surface mounting LED luminaire designed for a creative lighting effect whilst delivering functional lighting outside. Architectural Wall has an attractive anthracite IP65 rated aluminium housing and polycarbonate optic providing a contemporary look. 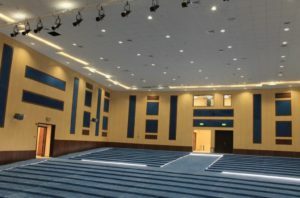 Abdul Razzak Al Basir Secondary School now benefits from the huge advantages of LED energy efficient luminaries, providing cost effective, durable, and safe lighting.